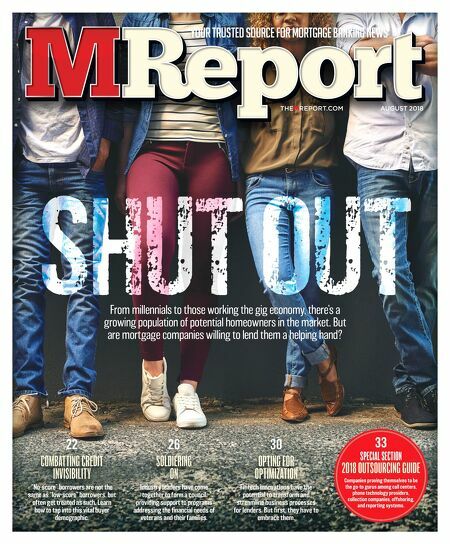 AUGUST 2018 THEMREPORT.COM YOUR TRUSTED SOURCE FOR MORTGAGE BANKING NEWS From millennials to those working the gig economy, there's a growing population of potential homeowners in the market. But are mortgage companies willing to lend them a helping hand? 22 COMBATTING CREDIT INVISIBILITY "No-score" borrowers are not the same as "low-score" borrowers, but often get treated as such. Learn how to tap into this vital buyer demographic. 26 SOLDIERING ON Industry leaders have come together to form a council providing support to programs addressing the financial needs of veterans and their families. 30 OPTING FOR OPTIMIZATION Fintech innovations have the potential to transform and streamline business processes for lenders. But first, they have to embrace them. 33 SPECIAL SECTION 2018 OUTSOURCING GUIDE Companies proving themselves to be the go-to gurus among call centers, phone technology providers, collection companies, offshoring, and reporting systems.